Charles Willeford’s crime novels are favorites of genre connoisseurs, but only three have been made into movies: Cockfighter, The Woman Chaser, and Miami Blues. They’re all very good, and they all help explain why his work hasn’t been mined more. To do this particular author justice, filmmakers can’t pander, or retreat into convention. His books are dark, funny, and strange, in ways that defy expectation; and though they’re packed with incident, their plots don’t follow familiar paths. There’s a lot about Willeford that can easily make audiences uncomfortable—and uncomfortable doesn’t sell. Which is all the more reason to treasure the few films that not only attempt to adapt Willeford, but also get him right. In 1990’s Miami Blues, writer-director George Armitage is so in tune with the material that he resists the temptation to make it a movie about Willeford’s most likable, popular character: detective Hoke Moseley. Fred Ward plays Moseley in Miami Blues, and gives the kind of performance that could’ve easily spawned a modest franchise. With his false teeth, affable demeanor, quiet doggedness, and willingness to have many, many beers with his suspects, Ward’s Moseley is a delight. The safe route for Armitage would’ve been to put him front and center in nearly every scene of Miami Blues—and then maybe to have adapted the three other Moseley novels Willeford wrote before his 1988 death. Instead, Armitage focuses on the man Moseley’s after: an unhinged ex-con who calls himself “Junior,” played by Alec Baldwin. In Miami Blues’ first scene, Junior flies into Florida from California, steals another passenger’s luggage, and breaks the fingers of a Hare Krishna who pesters him about enlightenment. For most of the next 90 minutes, the movie follows Junior as he embarks on a twisted crime spree, casually stealing wallets and breaking into homes as though he thinks he’s invisible. When he swipes Moseley’s badge and starts using it to rob other criminals, Junior’s sloppiness catches up with him. Baldwin’s take on Junior runs deeper than just “cocky madman.” Adopting a light California drawl and a frighteningly phony grin, Baldwin suggests more about Junior’s past and predilections than may have been in the script. He plays the character as an overgrown kid, whose attempts to fake being a grown-up clash with his poor impulse control and entrenched misanthropy. Armitage frames his behavior as funny, in a blackly comic, deadpan way; but neither the director nor his star lose sight of how dangerous Junior is, or how he believes that he’s entitled to whatever he takes. 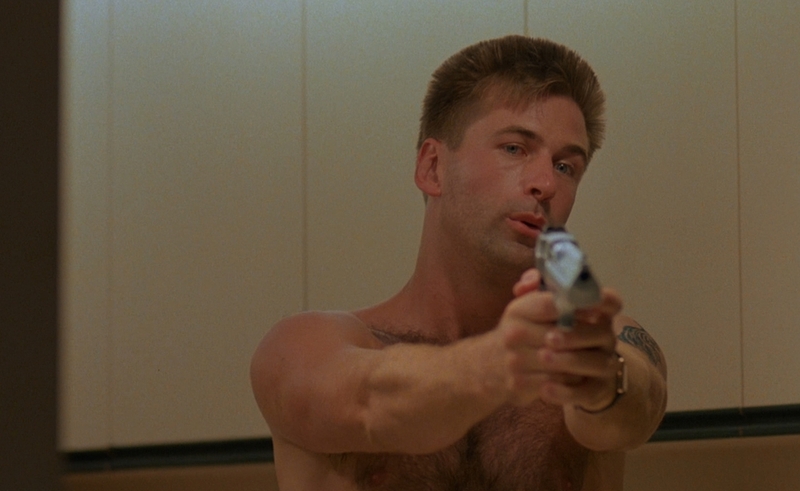 Miami Blues was produced by Jonathan Demme, who at one point was going to direct, and who gave the script to Baldwin while they were working on Married To The Mob. Though it’s definitely Armitage’s film, Baldwin has said that it’s also of a piece with Demme’s work, in that it’s more sympathetic to its main female character than to the leading man. (Baldwin believes that in Demme’s movies, heterosexual males tend to be “the deviants.”) In Miami Blues, Junior’s matched up with Susie Waggoner, a small-town Florida girl who’s been working as a prostitute in Miami while finishing her college degree. Jennifer Jason Leigh’s performance as Susie complements Baldwin’s Junior. Her genuine sunniness represents the person that he wishes he were, and the ideal that he’s been trying to assume as his own, even though he hasn’t earned it. Armitage’s Hollywood career started in the late 1960s, and prior to Miami Blues, he’d worked with Roger Corman, same as Demme, and had directed three well-regarded early 1970s drive-in pictures. Though Miami Blues suffers some from its dated score and its TV-like editing transitions (corny-looking flips and wipes and such), the same wit and personality that made it a cult favorite in the 1990s still goes over like gangbusters today. The film’s quirks stand out: Moseley’s dentures, Susie’s fascination with haiku, Junior smugly flashing a badge after shooting people in public, and so on. But what makes Miami Blues so true to Willeford is that its “fun,” fizzy elements don’t completely dispel the roiling bile in its belly. Credit Armitage for understanding that Moseley and Susie work best as occasional notes of contrast to Junior, who tries to stay positive but can’t help revealing his underlying philosophy: “This world’s a shithole.” When Junior orders the same salad with yogurt dressing that Susie’s eating, it’s meant to be funny when he spits it out and says this “ice cream” tastes lousy. But when he immediately snarls at the waitress and storms out—as though it’s her fault that he ordered badly—that’s no joke. It’s another example of how even the breeziest Miami Blues scene can suddenly turn chilling. The lone featurette on Shout! Factory’s new Miami Blues Blu-ray lacks any input from Armitage or Ward, but it does have 20 minutes of new interviews with Baldwin and Leigh, who talk about their lasting affection for this movie—and what it did for their careers. Both had been kicking around Hollywood throughout the 1980s, mostly stuck in generic character parts that traded on their physical attractiveness. Miami Blues put both in the lead, giving them enough screen-time to add more depth and shade to two colorful people; and it also allowed them to get some separation from the other big roles they played around the same time, in The Hunt For Red October and Last Exit To Brooklyn. Within a few years, Baldwin would be delivering his “brass balls” speech in Glengarry Glen Ross, while Leigh would have knockout back-to-back performances in The Hudsucker Proxy and Mrs. Parker And The Vicious Circle. Savvy cinephiles recognized those moments as Baldwin and Leigh fulfilling the promise of Miami Blues.